Westosha Central freshman Kyle Mitchell, who hit a bases loaded single in the bottom of the ninth to give the Falcons a 6-5 decision, receives a shower from his teammates following the May 10 contest against Wilmot (Earlene Frederick/The Report). 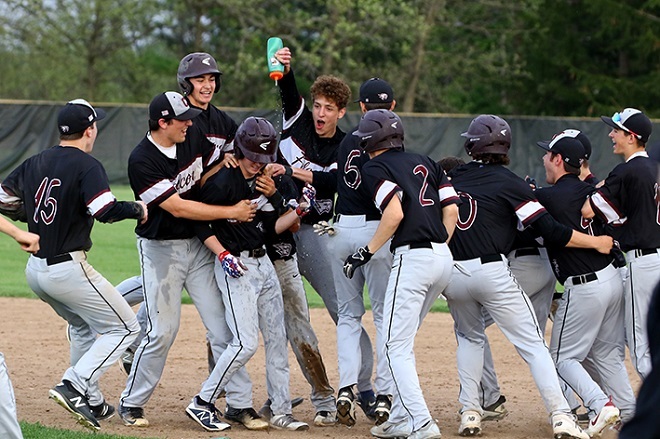 Looking to bounce back after an extra-inning loss to Wilmot Union High School two days earlier, Westosha Central nearly had a case of deja vu May 10, when the team hosted the Panthers in the second game of the season series. The Falcons, who lost 6-5 in eight innings at Wilmot, needed nine innings and freshman Kyle Mitchell to return the favor. With the score deadlocked 5-5 entering the bottom of the ninth, the Falcons loaded the bases for right-handed Mitchell, who connected on an opposite field single to score the decisive run. For Mitchell, the single served as redemption, considering the freshman was hitless in his first four plate appearances. “It is awesome, especially being 0 for 4 going in,” said Mitchell. Falcons coach Jacob Morman said the walk-off single can only bolster the freshman’s development. The Falcons win, however, comes in spite of a Panthers’ Gunner Peterson home run in the top of the eighth inning. Gunner Peterson, who handed the Falcons their 6-5 loss in the bottom of the eighth on May 8, stunned Morman in the dugout. “It was a pretty empty feeling in the dugout, but I knew my guys would put up a fight,” Morman said. While Gendron’s three runs were unearned, all in the Westosha Central bottom of the third, the Panthers senior struck out 11 hitters and did not issue a walk. “(Kyle) is a good pitcher, he mixes his pitches well and has good off-speed stuff, which keeps us off-balance,” Morman said. Gendron, according to Panthers coach Josh Pye, kept the squad in the game. “Whenever Kyle gets on the mound, he is pretty dialed in, he does a great job of challenging hitters,” Pye said. Anderson, Gendron’s counterpart, allowed two earned runs on six hits and struck out two for Westosha Central (10-5, 6-5 Southern Lakes Conference). Anderson’s pitch selection presented a challenge for Wilmot (13-4, 8-3 SLC). Both pitchers received no decisions. Anderson allowed his first run in the top of the first inning, where Justin Paasch hit a two-out single to plate Gunner Peterson, who advanced on a fielding error. Trailing 1-0 entering the bottom of the third inning, Westosha Central pulled the contest in its favor, sparked by a sophomore Andrew Hrncar run scoring double to plate senior Myles Kazumura. Kazumura, who went 2 for 4, led off the inning with a single and moved to third on a Glidden double. Glidden and Hrncar then scored on a senior Sam LeFebve single. Wilmot, down 3-1 after five innings, deadlocked the contest 3-3 with a two-run sixth inning. After a Tanner Peterson double, Paasch struck again, belting a two-run home run to dead centerfield. Paasch batted 2 for 4 with a team-leading three RBIs. In the top of the eighth inning, the Panthers pulled ahead 5-3, thanks to a Gunner Peterson leadoff home run followed by a senior Jacob Gerzel run scoring single to plate Gendron. Gerzel went 2 for 4. The Falcons knotted the game at five apiece in the bottom of the eighth inning. Samy Greco, who batted 2 for 4, hit a two-out double to plate senior Cooper Griffiths. Greco then scored on a single by Anderson. Anderson went 2 for 4. In the following inning, Hrncar and Leslie hit back-to-back singles, followed by a Griffiths intentional walk to load the bases for LeFebve. After LeFebve grounded into a fielder’s choice, Mitchell went to the plate, where he knocked in the winning run. Griffiths picked up the win in relief, tossing 2 1/3 innings, struck out two and allowed an earned run on two hits. Frisby, Wilmot’s fourth pitcher, took the loss. He struck out one, walked one and allowed an earned run on three hits.